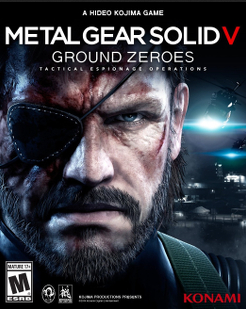 Netto's Game Room: Metal Gear Solid V: Ground Zeroes - ESRB Rating in and it is quite shocking! Metal Gear Solid V: Ground Zeroes - ESRB Rating in and it is quite shocking! With Metal Gear Solid V: Ground Zeroes' release just around the corner, it's no surprise that the ESRB has already released a rating for it; however, this time around there is something quite shocking about the rating itself. Just as expected the game is rated M, it contains blood and gore, and strong language, but it also has another mark against it; one that only ONE other game rated by the ESRB has ever received. The Sexual Violence warning. Awhile back, before we even knew that Metal Gear Solid V was in the works, Kojima himself stated that he was worried that Ground Zeroes would never see the light of day. He mentioned how it would deal with controversial themes, and that he wasn't sure if he would be allowed to release such a game. Well, we now know what he was talking about. Below is the description of the game from the ESRB Website. Please keep in mind that this description contains some SPOILERS, so avoid reading it if you want to remain completely in the dark about the game; however I will say that the section of the rating pertaining to the sexual violence is found in the last few lines. If you are curious. Rating Summary: This is an action game in which players assume the role of an elite soldier through military missions in Cuba. Players infiltrate various bases and use pistols, machine guns, and rocket launchers to kill enemy soldiers. Firefights are highlighted by realistic gunfire, slow-motion effects, and large blood-splatter effects. Players can also employ stealth attacks (e.g., choking, knife stabbing from behind) and have the ability kill non-adversary characters/prisoners. One cutscene includes a depiction of blood and gore (e.g., a character's intestines exposed during a dramatic procedure to remove an object). The game includes an audio file in which a female character is sexually assaulted by male characters; while there is no visual depiction, sounds of ripped clothing and struggle can be heard. The words “f**k” and “sh*t” are heard in the dialogue." The other thing that is interesting about the rating is that Snake will be able to kill innocent people as well. Kojima did say that you would have complete freedom in MGSV, but the ability to kill random people goes against everything Snake stands for. It's just a little bit strange.